This was our last chance to rehearse sets for the tour before we hit the road. We’d booked 3 hours so plenty of time to run through all the originals plus a bunch of covers we’ve decided to add for the open mic sessions and hostel shows. 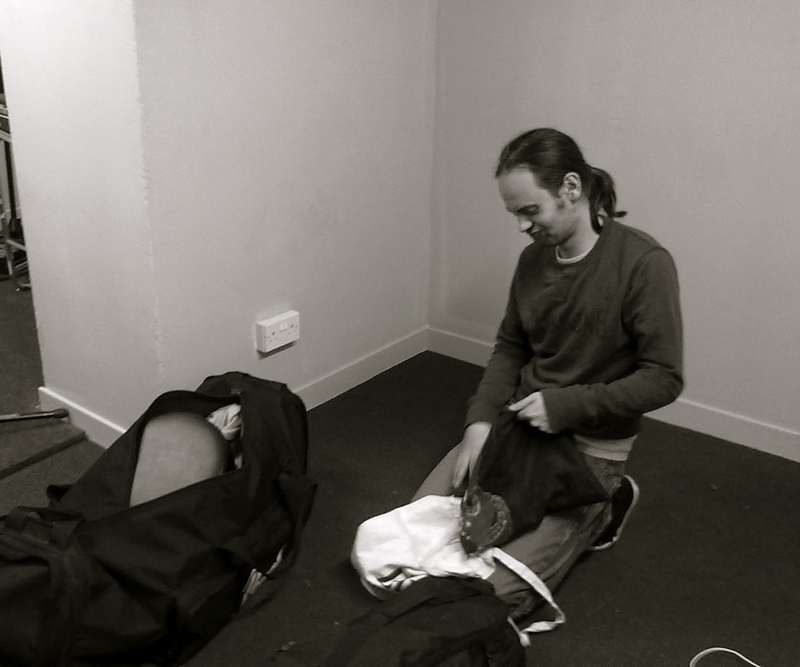 We love to practice at Bainbridge on Iona Street – the rooms are always clean and the PA is good. 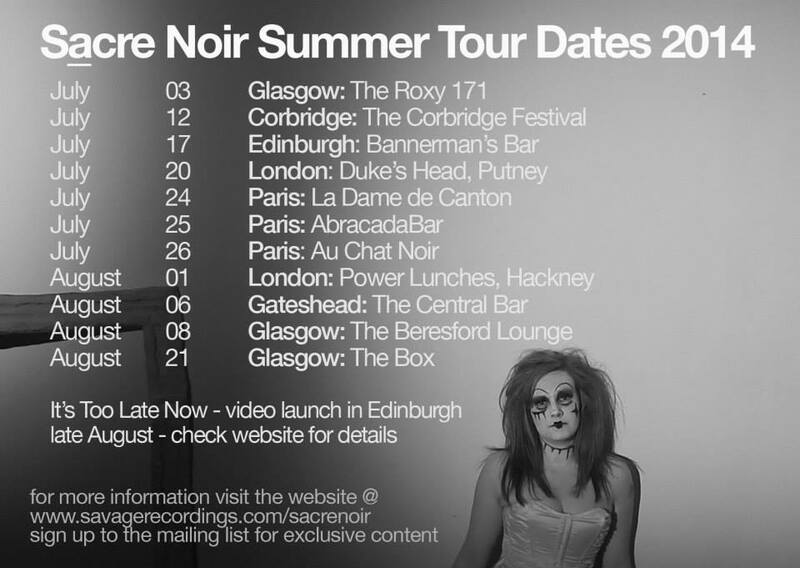 Owners Chris & Angus have always been great at providing support for Sacre Noir, even allowing us to use their other Edinburgh studios to film our 2nd video / single ‘Rue Crimée’. We chose the track Rue Crimée from the LP Sinking Into Darkness to be the 2nd single/video release, following the sucess of She Can’t Take It. There will be a trilogy of single/video releases from this LP following a set of characters and peeking into their chaotic world. 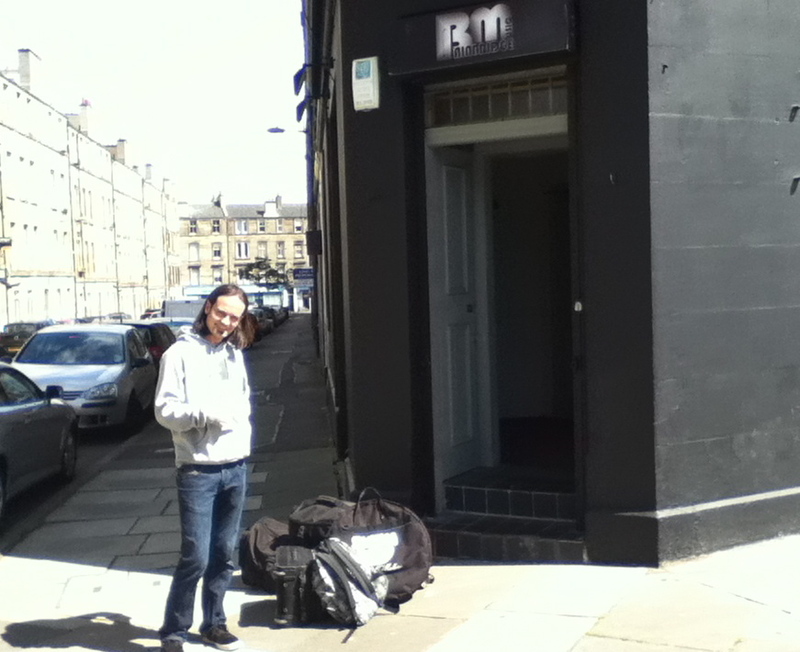 The video for Rue Crimée was filmed & edited by Stuart @ Aristotle Events Filming on location in Leith, Edinburgh. Special thanks to Angus & Chris @ Bainbridge Music for the support and use of their Vaults. Stuart stepped in at the 11th hour to help out and has worked really hard to deliver a fantastic follow up to the first release. The idea with this trilogy is that we’d like to work with 3 different film-makers to complete the project, so that each video will have a similar feel, but different at the same time. We’ve been really impressed with Stuarts work & I’m sure we’ll work with Aristotle Events Filming again in the future (maybe when we get the next album finished or on a live project…). The track was inspired by the time we’ve spent in Paris and delivers another gritty slice of electronica. It was my birthday a few weeks ago and AlexisSs got me tickets to see one of my favourite artists Amanda Palmer – tonight’s the night! We arrived at the venue just in time to see über-support act ‘The Horn Dogs’ performing in the crowd. This Edinburgh based collective have been big supporters of Amanda for a long time now and even play on the recording of ‘Leeds United’ from her 2nd solo LP. 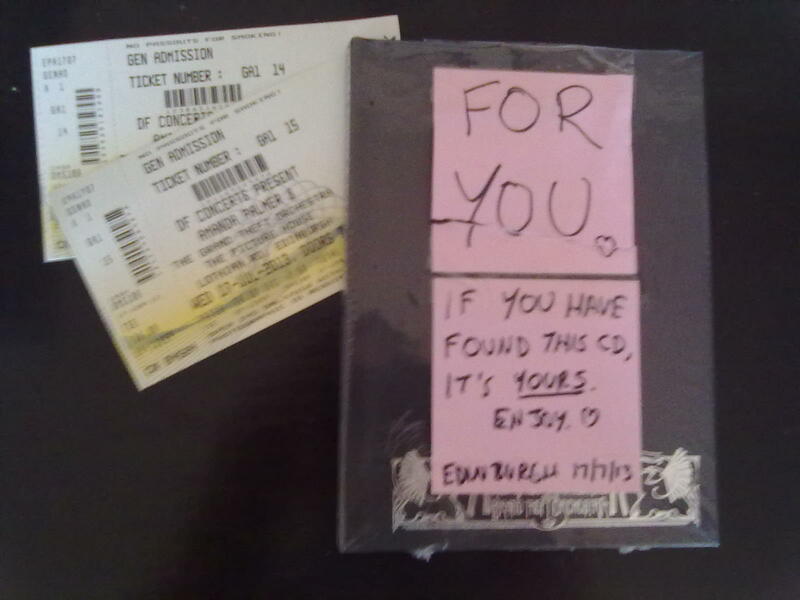 Soon after their opening set AlexisSs found a little gift from Amanda – thanks. I was a huge fan of her band The Dresden Dolls and have seen her perform a few times before, so am really looking forward to the show. Previous gigs have all been high energy and inspirational, filled with emotional highs and lows and tonight was no different. Amanda Palmer & The Grand Theft Orchestra played a mix of tracks from their new LP ‘Theatre Is Evil’, Dolls and AP solo tracks plus a perfect cover in the form of “Smells Like Teen Spirit”. We were treated to a ukelele version of a brand new track called “Bigger On The Inside” that left everyone with a tear in their eye. It was truly a great show! The support acts for the evening were mainly made up of projects from her Grand Theft Orchestra; Jherek Bischoff, Chad Raines (Simple Pleasures) plus a special performance by Brighton based duo, Bitter Ruin – they were great and I’d really like to see their full show at some point in the future. 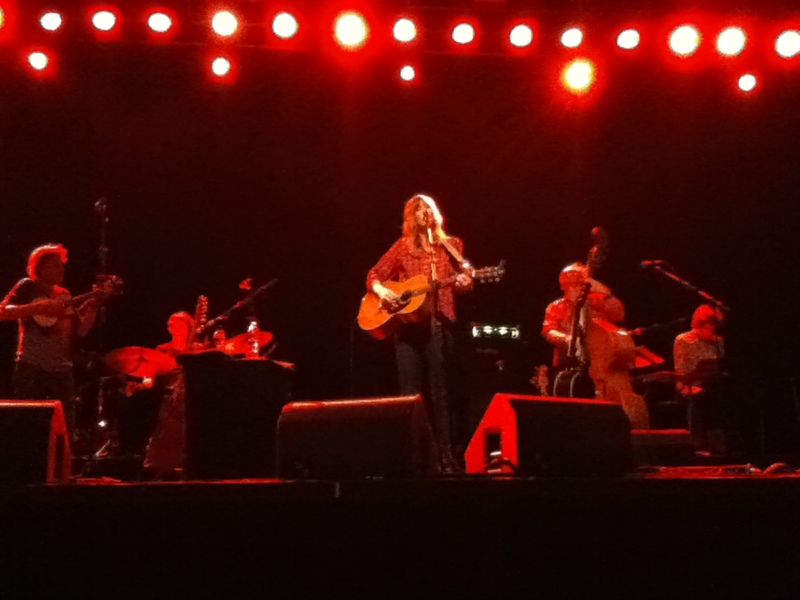 Amanda also had Thor Harris (Swans / Shearwater) on drums for this show which was amazing.